From 11 April, two monsters of evil noise arrived from The Netherlands. Both these spray-painted CDRs by Doodshoofd are pretty striking examples of non-stop intensive feedback grind, or HNW as the connoisseurs would have it. Geenheidsworst announces its obnoxious presence with two long tracks that will destroy 23 minutes of your peaceful life, and somehow finds space for pouring out a further 45 minutes of remorseless hell, defying the restrictions of the CDR format. Politiestaat erupts with seven slightly shorter works and a shade more “variety” in the way it executes its brutalising slabs of painful, hot scalding acid and chainsaw attacks, but still ends up delivering the necessary punch to leave most listeners in a swoon for eight days. Doodshoofd, whose name translates as Death’s Head, comes from Almelo, celebrates the power of anger and despair, and doesn’t stint when it comes to spreading these destructive emotions thickly all over his power-noise work, of which these two examples are packed in scuzzy grey xeroxes of a sort which I’d thought we’d lost in the 1980s. Distributed by Stirner and SkumRex. Cough Cool‘s self-titled CD (DEBACLE RECORDS DBL055) is a reissue of his first cassette, remastered onto CD by this Seattle label. Seven songs in 20 minutes reveal the complex and unusual emotions which traverse the brain of Dan Svizeny, which he delivers with an idiosyncratic mix of minimal synth, guitar and drum music, occasionally allowing his electric guitar to roar in loud sweeps. His vocals invariably reach us through filters and distortion effects, adding to the sense of distance and remove. This could prove quite a grower; I like it best when his lyrics remain dumbed-down to the point of incoherence and he seems unable to do more than mumble the same inexpressive inanities over and over in time to his off-kiltre chords and beats. This was released early April. Got a couple of newish Black Metal releases which arrived 11 April from Ladlo Productions in France. Numen are a five piece of pagan folk-metallers from the Basque country in Spain and the self-titled CD (LADLO PRODUCTIONS AO-004) is a re-release of their 2007 album. They’ve been going since the late 1990s and sing all their grisly yet hearty songs in the Euskera tongue, a tactic which may endear them to fellow Basque countryman Mattin. Competent enough fast guitar work and screeching songs is what they give us, seemingly “following the path of the ancient cult”. Cult Of Erinyes have released A Place To Call My Unknown (LADLO PRODUCTIONS AO-003), a more recent endeavour recorded last winter and offering nine songs about oppression and torture, in the “ritualistic BM” mode. Again, fast and overloaded music is the keynote here, but Corvus (main man who plays almost all the instruments) sometimes leads the drummer down some unexpected side trails. Inside an elaborate chip-board outsize wallet is housed Mathieu Ruhlmann‘s latest endeavour of subtlety ANÁÁDIIH (3LEAVES 3L006), a 40-minute meditation in six parts which contemplates the beauties of the forest, plant life, the skies and mountain-dwelling with an enraptured awe. Banks Bailey is co-credited with producing these recordings, which to my ears seem to include many choice fragments and selections from nature’s bounty – insects, birds, horses, fire, water, weather and air, and certain unseen activities that might cause the bark of an elm to creak in sympathy. There are at least two layers of recording in motion at any one time, and sumptuous overlaid beauties emerge like multiple exposure photographs. Our Hungarian friend Ákos Garai did the mastering for his 3Leaves label on this, one of the clearest and most straightforward things I have heard from Ruhlmann’s catalogue (he can sometimes indulge in opaque murk and metaphysical conjecture). Comes with a tipped-in colour cover and a printed insert, and a paper band around the package. Arrived from British Columbia, home of the huge wooden log, on 04 April. WP31 / REDUKT 014 is a CD packed in a DVD wallet on the Wachsender Prozess and Reduktive Musiken imprints from Germany, although my copy arrived from France on 18 April and was sent here personally by one of its creators, the impenetrable genius of “quiet noise”, Guido Huebner. 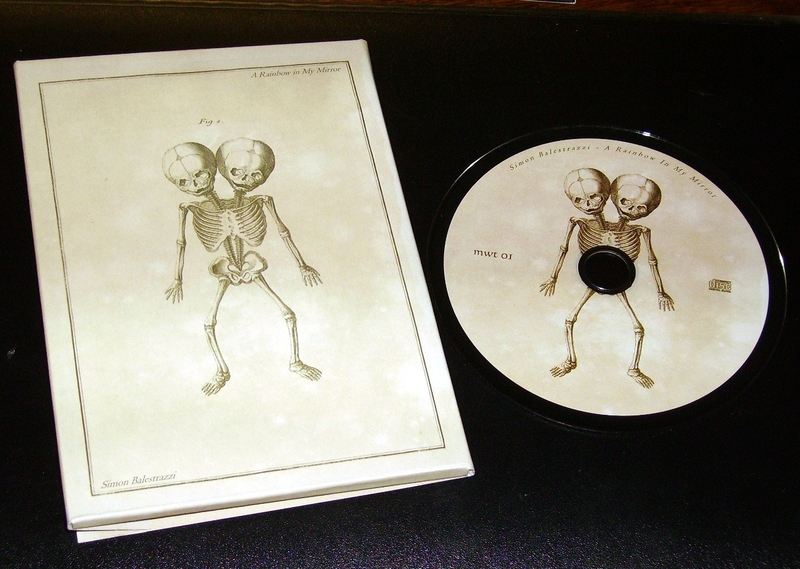 As Das Synthestiche Mischgewebe, he performs the first long composition on this split CD with the title ‘Notre Besoin D’Attachment Est Aussi Celui De Rupture’. Unlike some of DSM’s compositions which have involved fragmentary cut-ups, this piece feels like it’s more of a start-to-finish document with no edits, but what strange event may have been transpiring before the microphones of Guido and Samuel Loviton is anybody’s guess. DSM specialises in this producing this extremely puzzling and alienating effect in his sound art that is well-nigh impossible to understand; this instance may start out like errant birds rattling the tops of empty milk-bottles, but it soon becomes a complex and difficult episode of vaguely electronic effects, rattles and pops. TBC‘s contribution, ‘They Never Come to Hit the Public’, has more substance than DSM on first impression, using synths and tapes and various processes to produce exciting variations on traditional musique concrète techniques. Moving freely over imaginary and real terrains in just 20 minutes, TBC is capable of a rowdiness that DSM would probably find most unseemly. But the combination of the two on a single release is just perfect; TBC’s piece is like a walk in fresh air after the cramped confines of DSM’s obsessive and vaguely neurotic internalising. Simon Balestrazzi (1980s veteran composer and member of T.A.C.) kindly sent us three excellent new items on his Magick With Tears label, which have been languishing here in the box since 31 March. These mini-CDs (all 20 minutes) are limited editions and handsomely packaged in unusual outsize cartons which resemble slim volumes of esoteric texts. 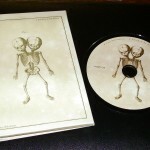 Uncodified: released Involucri (MWT 03), 20 minutes of splendidly supernatural droney effects whose single-mindedness I find most enjoyable, like being led down a strange tunnel below the surface of the earth by a big owl. All the more credit to this Italian musician for eschewing the use of computers in creating these strong and complex drones. Simon Balestrazzi‘s A Rainbow In My Mirror (MWT 01) is a lovely jumble using many acoustic stringed instruments (including a psaltery), organ, tapes and electronics; a rich and complex work that remains all of apiece despite meandering into many forbidden sonic territories. He does indeed imbue this 21-minute work with a sense of the possibility of time-travel or supernatural scyring, and it’s decorated with numerous images of skeleton siamese twins. Simon resurfaces on Untitled Soundscapes (MWT 02) as one-third of A Sphere Of Simple Green, an improvising group which also includes Adriano Orrù and Silvia Corda. Matter of fact his psaltery makes a reappearance here, along with his trusty VCS3 murmuring minimal mysterious electro-utterances that are quite sublime. Prepared piano and bass are the basis for most of this work, creating all manner of unholy textures with their hearty full-bodied scrape and nerve-shredding jangling. Kind of like a speeded-up and impatient version of MEV with added dark clouds of aural uncertainty, these three guys get the job done in half the time and for a fraction of the cost. Only the indifferent front cover disappoints here, although the interior is more intriguing with its gallery of abstract drawings.